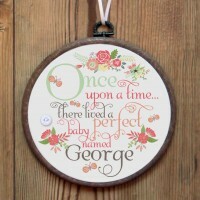 A beautiful personalised name gift - the perfect keepsake for a new baby, Christening or 1st Birthday... 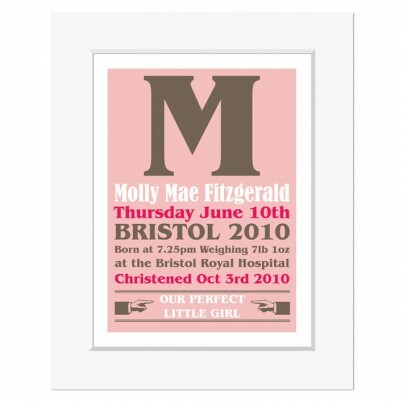 Created to order, this sweet personalised print is available in pink or blue. 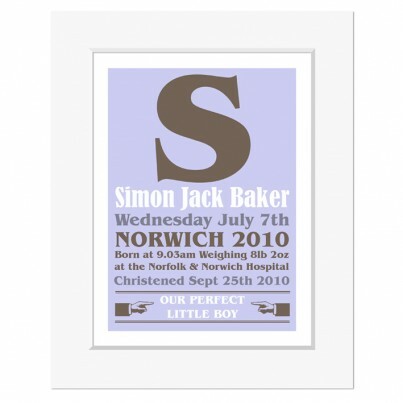 (The print features the words "our perfect little boy/girl" - however this can be altered if you would prefer it to say something such as "my perfect little boy/girl", etc. Just use the space provided below to state your preference.) About your Print: Your artwork will be created to order and printed onto very high quality, 240gsm gloss finish paper stock. It will be posted with a backing board and smooth white finish bevel cut mount, and sealed in a protective crystal clear sleeve. Your print will be posted in a strong hard backed envelope and will require a signature on delivery. The overall size of the mount is 10"x8" and will fit into any standard 10"x8" picture frame. Your print will be posted via 1st class recorded (signed for) delivery and will be dispatched within 5 working days. UK orders only. Postage per item £3.50. PRINT SIZES: 8x10" prints will fit into any standard 8x10" picture frame. 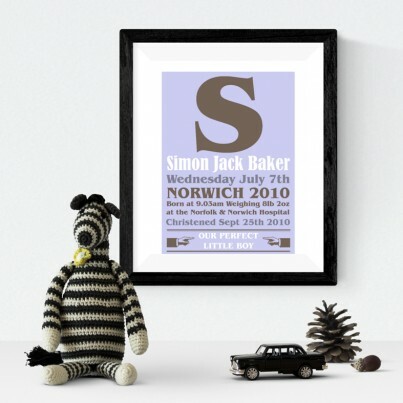 A3 prints will fit into any standard A3 picture frame. CANVAS SIZES: 8x8" canvases are approximately 20mm deep. 10x10" canvases are approximately 40mm deep. Please see item descriptions for details of the delivery service and time scale for each item. 1st class/1st class recorded delivery takes approximately 1-2 working days. 2nd class delivery takes approximately 2-4 working days. Courier carrier takes approximately 2-5 working days. In the rare event that an item arrives damaged, you will be requested to supply photographic evidence so a claim can be made against Royal Mail. You will be issued with a replacement item at no charge. (Please note: if you do not keep the damaged item and packaging, or supply photographic evidence of the damage, it may not be possible to replace the item.) Delivery times are as supplied by Royal Mail and the Courier and can occasionally take longer than expected to arrive, particularly at busy times such as Christmas. If you believe your delivery is late do please get in touch. An item will not be classed as lost or undelivered until 15 working days after dispatch, as there is still a chance of delivery taking place during this time. When you feel an item has been delayed it is advised that you please check with your local sorting office and neighbours to see if the parcel is being held there (the postman may not have left you a card advising that they were unable to make delivery). If after 15 working days your item has still not arrived a replacement item will be sent to you at no extra charge. Any item which is faulty, lost or damaged in the post will be replaced promptly and without quibble. However, in the event that a mistake is made which is the responsibility of the buyer (e.g., incorrect spelling, grammar, etc.) at the point of ordering, everything possible will be done to rectify the problem for you but please note that this will incur additional charges. Any images received from a customer to be used in their order are accepted on the understanding that you own the image or have permission from the owner. All designs and images featured on this website within the PhotoFairytales shop are the property of PhotoFairytales and Sarah Thexton, and cannot be duplicated without permission. Due to the nature of the service, each piece of artwork, print and gift is created to order, and therefore cannot be cancelled or returned once the order has been made unless it is faulty (and PhotoFairytales is at fault) or it arrives damaged.